[darts] Hello and welcome to our live coverage of the World Grand Prix Final between world No 1 Michael van Gerwen and James Wade. The action in Dublin is LIVE on Sky Sports 1 HD from 7pm (BST). @SkySportsDarts bring on the final! MVG v The Machine and a beer! sunday nights dont get better than this! 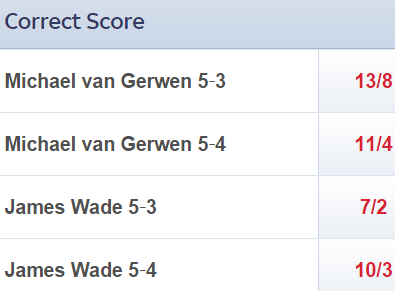 Van Gerwen starts set five by missing his first three doubles and then hits 79, allowing Wade to steal a march. 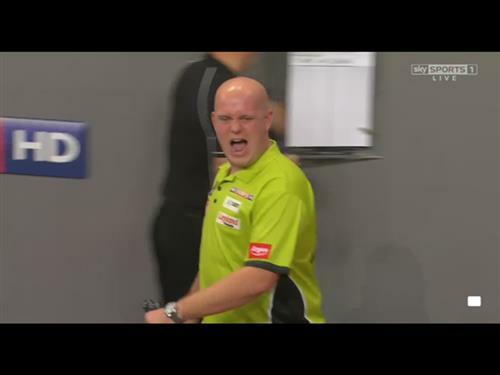 MVG produces a maximum to stay in the hunt and then nails 140 to leave 8. Wade needs 87 but misses double-five ... and Van Gerwen then misses three doubles! Wade hits double-one to hold throw after a tense leg. Wade needs seven darts to hit his starting double and that is asking for trouble but he then manages a 180 to get on Van Gerwen's tail. 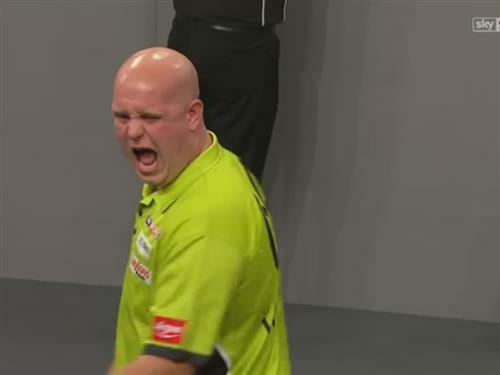 MVG hits double-eight though and we are level again. Scrappy stuff! Wade misses his first six doubles but the Machine can't get back into it this time as Van Gerwen sets up double-10 with a sensible 128, and grabs the lead for the first time in the match. Nightmare for Van Gerwen as he misses six doubles to get started and finds himself 300 points behind after briefly forgetting he had not got off. Wade has all day to set up double-10 and level up. MVG will not be happy with that leg! Three misses from Wade but he opens his account for set four with 160, only for Van Gerwen to reply with a maximum! He adds 98 to set up 48 and he hits double-16, double-eight. Exhibition stuff! Streadier darts in that leg until Wade whips a 180 out of nowhere to storm clear. 61 needed and he goes outer-bull, double-18! How else would you do it? Wade is still buzzing after that 141 and he dashes clear in this important leg. 96 needed and he does it in two darts to complete three very impressive legs and level it up at 3-3. What a great final! Fifth maximum of the night from Wade and he is on 204 before Van Gerwen has even got started in set seven! A solid ton leaves 44 for Wade and tops seals the deal. Wade back in front! Big leg and Van Gerwen can only hit 57 at a massive moment. Wade hits 127 to leave 54 and then has two darts at tops. He only needs one! Tense stuff as Wade looks to wrap up set seven and they are both on 156 at one point. The Machine then hits 140 though and ... misses three doubles! 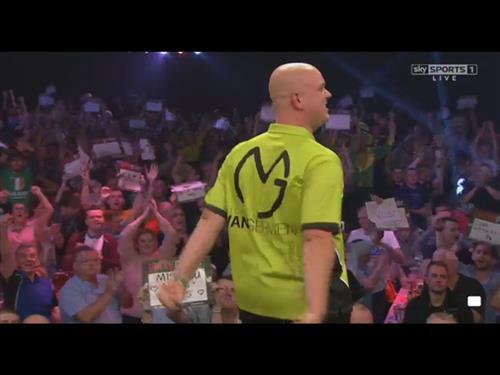 54 for MVG and he gets it to stay alive in the set. It was 5/6 each of two in the betting before this leg and Van Gerwen boosts his cause with 177. 106 needed and he delivers! What a leg we have on our hands now! The duo both hit a double to start at the third attempt and then it is neck-and-neck as they vie for the seventh set. Van Gerwen hits 180 to seize the initiative but Wade responds gamely with 128. MVG has a go at 86 and he then gets double-16 with Wade waiting on. That was big! Van Gerwen now huge favourite to secure the win and 2/5 to do so by taking the next set. Both players averaging just over 90 as set eight gets up and running. Wade needs to bounce back after somehow losing set seven from 2-0 up but misses his first five doubles. 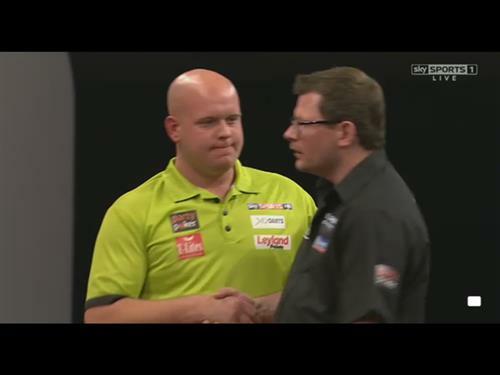 Van Gerwen hits 135 to ease well clear and quickly wraps up the leg to make it four in a row. Van Gerwen starts with 160 but Wade hits a handy 138 to stay in touch. He gets a chance at 65 and ... misses tops and then double-10! There have been some big misses from the Machine and MVG capitalises with tops to stand a leg from victory. 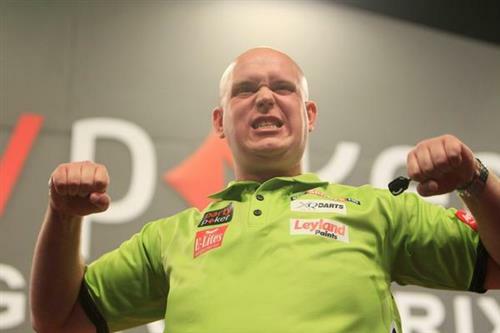 ... and Van Gerwen is the champion! It was an amazing tournament, the performance of everyone was so high. That I could win at this level is fantastic. James deserved more than this because he had a tough week, so I have to say well done to him. There can only be one winner and I'm so glad that's me. I really like this tournament, the Irish people and everything around it. Michael is great at doing what he's doing, at the moment. He is the man to beat. Unfortunately, I missed too many important doubles. But it's a step in the right direction for me and thank you to the crowd this week. They have been so good and they carried me over the line against Phil (Taylor). I am back to where I belong, playing good darts again. It was a superb final. We were probably expecting higher averages but that's not what makes a game. It was the closeness that made it a real contest. In the end, James came up a bit short but what a tournament he has had. This was just one step too far. Michael proved again how good he is. 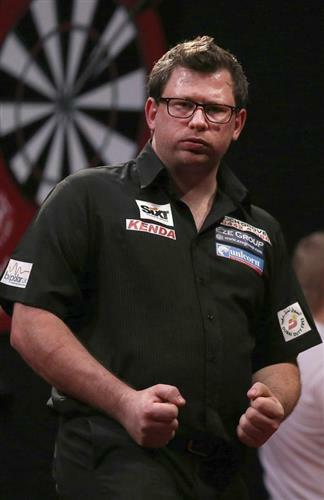 It was that seventh set when James Wade went 2-0 up and had three clear darts at a double to win it. I think, if he had got that, he would have gone on and won. Michael is very good at punishing people and that is what he did. He did not give James another chance. Well, that's it from us. What a great final, to cap a fine week of darts action. Well done to Michael Van Gerwen, who was rock-solid when it really mattered tonight and it was also fantastic to see James Wade playing such quality darts again. The future is bright for both. Thanks so much for joining us, see you in Wolverhampton (November 8-16) for the Grand Slam of Darts!